Analysts like to herald the death of the publishing industry. But one area that has held its own is the consumer magazine business. Of course there have been stunning successes and spectacular failures within that industry. 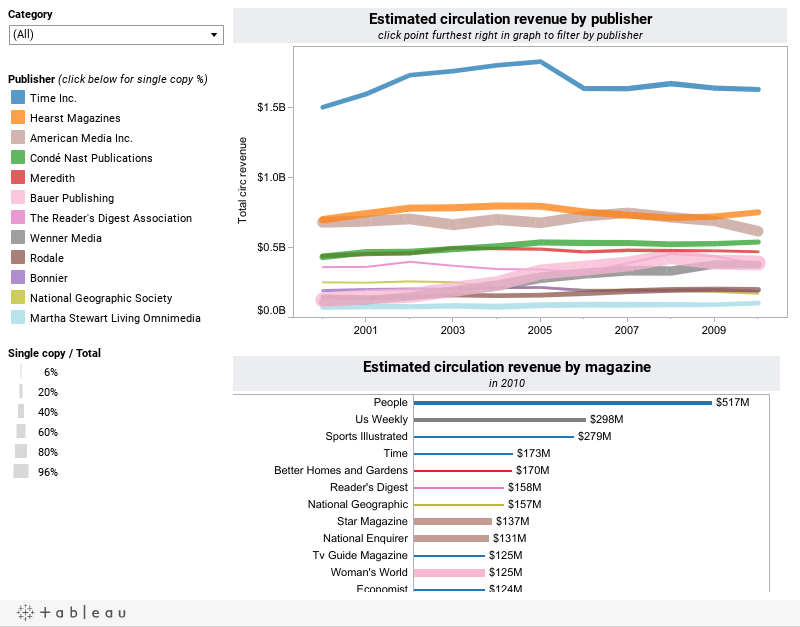 Below are interactive dashboards that showcase size, revenue distribution and circulation trends for the top 12 US consumer magazine publishers. 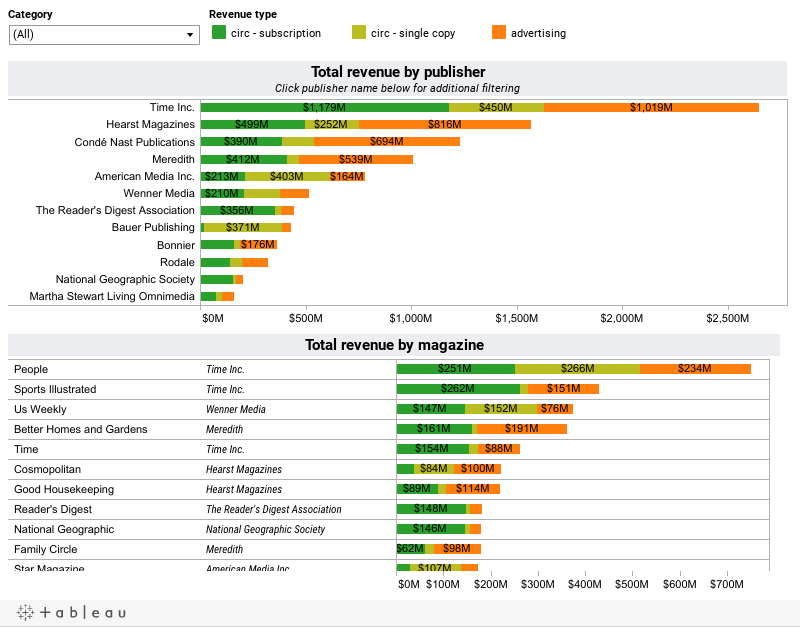 A big thanks to MPA, The Association of Magazine Media, which provides the circulation and revenue data on its site (see bottom of page for a description of the data sources used in building these visualizations). Spyglass Intelligence LLC has published A Competitive Assessment of the Top 12 Largest US Consumer Magazine Publishers, which you can purchase on Amazon.com. Also, feel free to check out my person website devoted to data narration and data visualization. Want data analysis or visualization for your company or industry? Contact us today! Our source for this data was MPA, The Association of Magazine Media, where we found both magazine circulation and advertising revenue data. Below are descriptions of the sources from MPA’s site. Publishers Information Bureau (PIB), founded in 1947, is the premier source of consumer magazine advertising spending and related data. Kantar Media, the leading provider of strategic advertising and marketing information, collects and monitors this data and supplies it to PIB. PIB is a membership organization, administered by MPA – The Association of Magazine Media, consisting of approximately 235 different magazine titles and newspaper-distributed magazines. Sources: Averages calculated by the MPA Info Center from Audit Bureau of Circulations Fas Fax statements for the first and second six months of each year. Includes only domestic titles audited by A.B.C. ; annuals, international editions and comics have been excluded. 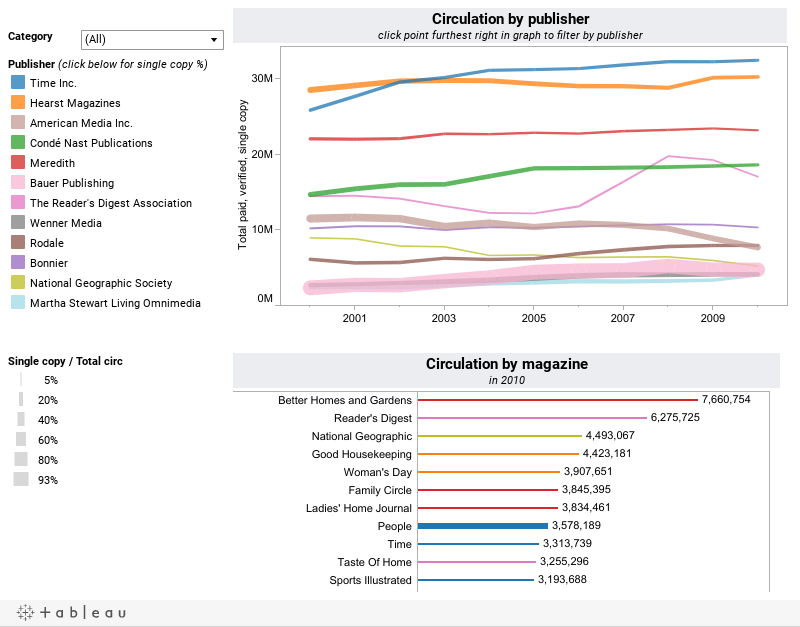 Only consumer magazine titles with a frequency of quarterly or greater qualify for these data sets. Totals may not add exactly, due to rounding of averaged numbers. The Audit Bureau of Circulations ruled in 2011 that digital editions would be reported as part of the Fas Fax data; as of March 2011 digital editions make up less than 1% of A.B.C.’s Fas Fax data.